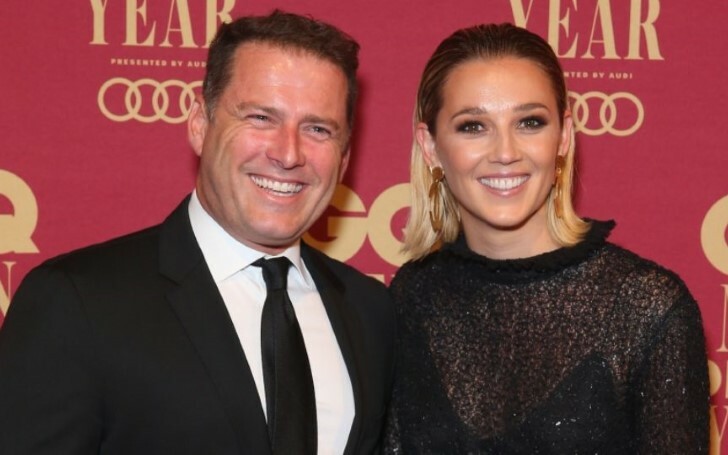 Karl Stefanovic and Jasmine Yarbrough are soon to be husband and wife couple. In 2018, Karl Stefanovic and his bride-to-be Jasmine Yarbrough were spotted at the Sydney airport set to fly to Mexico for their grand wedding. Their ceremony will be held on 8th December 2018 at the luxurious One and Only resort in Los Cabos. In the first place, Karl was spotted wearing faded skinny jeans, a white button-up shirt, a denim-look blazer accessorized with a baseball cap and brown boots. Whereas Jasmine wore a black blazer, black singlet, and a loose yoga pants. CAPTION: Jasmine Yarbrough spotted while heading to Mexico. At the airport, they were joined by Karl's children, Thorburn and River. As per some reports, his eldest son will not be attending the ceremony. Their guest list includes well-known personalities from Australians like James Packer, Julie Bishop & David Panton, and Richard Wilkins among others. Moreover, on 2nd December they were spotted picking up their wedding rings. The couple was leaving the luxury jeweler Cerrone. CAPTION: Jasmine Yarbrough and Karl Stefanovic collecting their wedding rings. Karl and Jasmine booked two villas one priced $11600 per night and another at $15k per night for the three-day celebrations at the One & Only Palmilla Resort in San Jose del Cabo. The soon to be husband and wife couple engaged in February 2018 after dating for months. It was rumored that her engagement ring worth around $12k. Earlier Jasmine was spotted showing off her incredible figure at Australian Fashion Laureate Awards.